← Do you like hooks, horns, and teeth ? Spindazzle was registered in 1983 as a spider by Wilson without much hoopla. Famed hybridizer, Ned Roberts, even had Spindazzle on his list as a daylily not to use as a parent because of below average color. Then by chance, Dan Trimmer opened a box of daylilies and Spindazzle was in the box as a gift plant. Dan was treating daylilies that day and treated Spindazzle just because it was in front of him. There was no advance planning, no illusions of greatness, just plain dumb luck with what transpired. When the conversion bloomed, several people commented to Dan that they could see tiny teeth at the base of the daylily, now Tetra Spindazzle. Dan really didn’t care about teeth as his program was focused in other directions, but he used it some as he loves to work with converted material. And Dan did produce a few introductions and bridge daylilies from Tetra Spindazzle. Dan’s most famed introduction from Tetra Spindazzle was LONG TALL SALLY, a fourteen inch varient spider in 1996. Dan also introduced CROCODILE SMILE in 1997 and VICKING STAR in 2001 as direct Tetra Spindazzle crosses. He shipped off to Bob Selman a seedling, garden named LAUGHING HYENA. Bob still sells this daylily today as an unintroduced Trimmer seedling. Dan began sharing his conversion with other hybridizers. Benz, Schwarz, Lambertson, Gossard we will talk more tomorrow….. 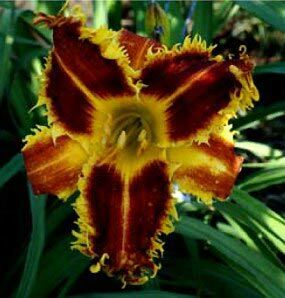 This entry was posted in Daylily Hybridizing, Seedlings and tagged Dan Trimmer, SPINDAZZLE. Bookmark the permalink.